Monsanto and other transnationals are attempting to plant Genetically Modified Maize at a commercial scale in Mexico. This would be the first time which large-scale planting of genetically modified crops would take place in the place of origin of one of the world’s basic food crops. This is a violation of the rights of the peasants which have created this crop over many generations and bequeathed it to humanity for the good of all humanity. From the VI International Conference of La Via Campesina, meeting in Indonesia from 6th to 13th of June 2013, attended by 183 organisations from around the world, we express our support for the struggle against genetically modified maize in Mexico and we reaffirm our solidarity with UNORCA’s protest hunger strike in defence of peasant varieties of maize. We also support the process of the Permanent People’s Tribunal in Mexico and it’s thematic hearing “Violence against maize, food sovereignty and people’s rights”. 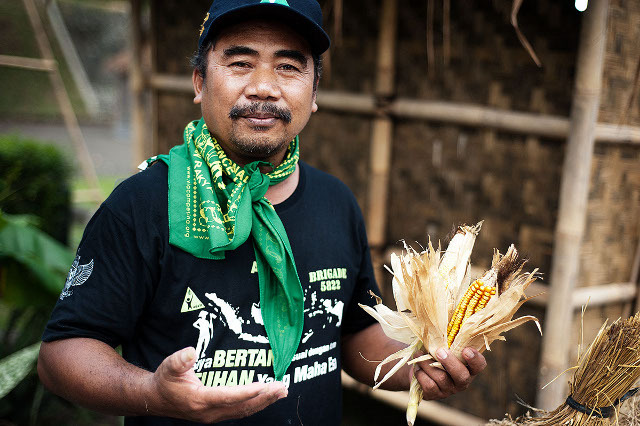 We denounce this new outrage that transnational companies have taken against peasants, against corn-producing peoples, against biodiversity and food sovereignty. No to Genetically Modified Crops! No to Transnational Corporation’s Seeds! Get Monsanto off the Planet! In Defence of Seeds, Diversity and Food Sovereignty.